Media surrounding the Middle East does not speak for its youth. And youth make up 65% of the region's population. That's 140M people between the ages of 15-35 who are largely rejecting the traditional media of their parents' generation because of its political nature. 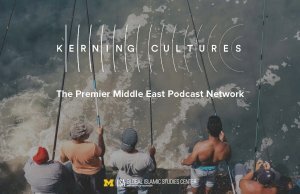 Kerning Cultures is the premier Middle East podcast network, quoted by The Guardian as "This American Life for the Middle East." Kerning Cultures is partnering with the University of Michigan to give Middle Eastern-American students & allies the opportunity to share their experiences, learn about the current state of Middle Eastern media representation, and how they can make an impact. On Tuesday, February 12th, 2019, The University of Michigan Global Islamic Studies Center will be hosting a Kerning Cultures listening party in 1010 Weiser Hall. We will listen to a Kerning Cultures episode and discuss it into the night with their Marketing Lead, Bella Ibrahim. The event is free and open to the public, RSVP at http://myumi.ch/J9DzE. Light refreshments will be provided. Sponsored by the Global Islamic Studies Center, with support from the Center for Middle Eastern & North African Studies, Digital Islamic Studies Curriculum, and LSA Honors Program.